The Flame Room is a tiny enclave in the eastern wall of the Hall of Memory. It houses a Flame of Remembrance burning in a flat dish mounted on a pedestal. 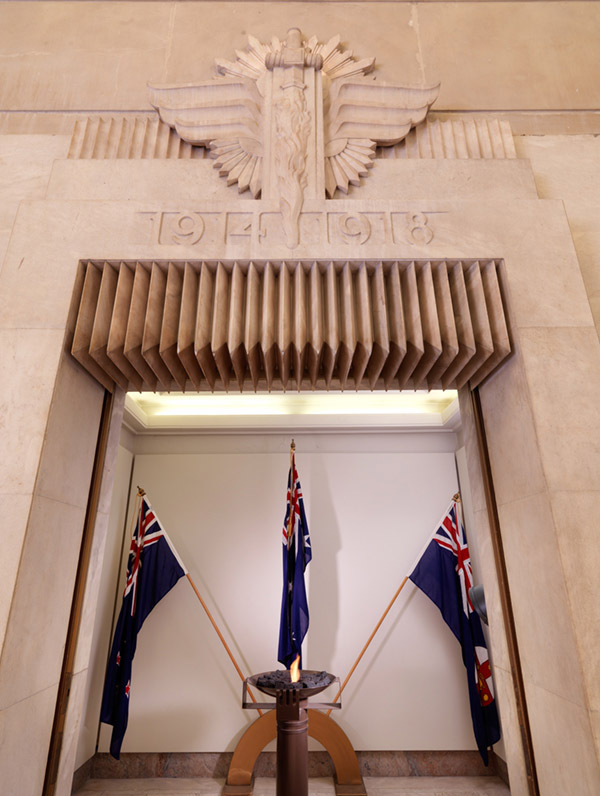 At the rear of the Flame Room, behind the pedestal are the flags of Australia, New Zealand and New South Wales. The Flame is a symbol of eternal life. The Flame of Remembrance at the Anzac Memorial burns to symbolise the gratitude of the Australian people to those who gave their lives in the service of our country in time of war. Architect Bruce Dellit had originally intended this space to serve as an 'Archive room, a small chamber wherein will be placed suitably bound volumes of the official history of Australia's part in the Great War...' from The Book of the Anzac Memorial, NSW (1934). The creation of this space was found to be impractical and in the 1990s the alcove was given a new purpose as the room to house the Flame of Remembrance. The Australian Gas Light Company (AGL Energy from 2006) donated and installed the Flame of Remembrance.